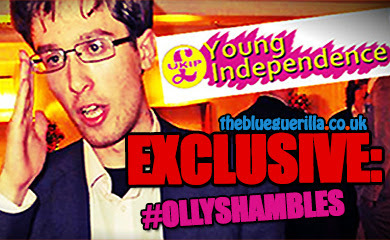 TheBlueGuerilla: EXCLUSIVE: New UKIP Councillor and Boston & Skegness PPC Gives First Interview to TBG. EXCLUSIVE: New UKIP Councillor and Boston & Skegness PPC Gives First Interview to TBG. "In the Boston / Skegness constituency, the results from the matching county council seats were UKIP 9506 votes/ Conservative 6814 votes/ Labour 3484 votes / Liberal no show, in fact we beat the Tories in ten out the the eleven coinciding county council seats and only lost that one by a small margin. "At the last election the Tory party increased their majority, but with this voting percentage at the next GE, it would mean that UKIP would now have it's first MP for Boston / Skegness. "It has blown the Tory claim out of the water that a vote for UKIP is a vote for Labour, as this clearly shows that a vote for UKIP means that you will get a UKIP representative ( this means that the Tories will have to change their plans to use this as their main point of attack for their next campaign). "The vote for UKIP came from all three of the parties, plus non voters too. In fact there were vast amounts of people not on the voting register stating that they will be in the near future and they will be voting for UKIP. "People are fed up with the Lib / lab / Cons promising anything to get elected and then forgetting these promises until the next election. "UKIP's policies are in tune with the views of the public, rather than ignoring key concerns that the public hold. What it says on the can is what you get and if you do not agree with our policies, I will not lie to you just to gain your vote, I will suggest that you vote for either of the Lib / Lab / Con parties as their policies are virtually the same. "The benefit of UKIP councillors is that they are not whipped to follow the party line, they are free to represent the concerns and issues of the local residents rather than follow the party instructions and I feel that this is how local councillors should act. "I find it quite amusing how the Tories are commenting on the effect of new councillors on the county council, after weeks on the streets the residents have been stating that they feel that we need new blood on the council to turn it around. 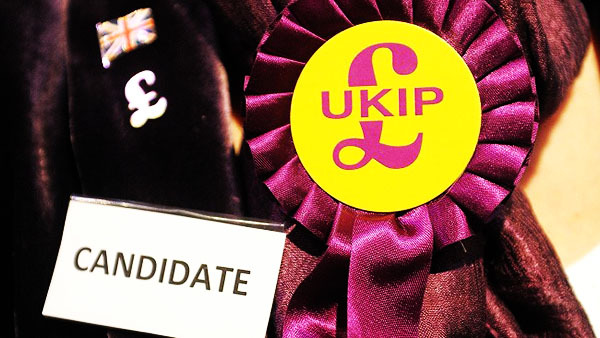 After all in the past councillors have been elected because they wore the right colour rosette, where as UKIP have broken through years of poor media coverage to put local business people into situ who will use their business acumen and common sense to help our county develop and prosper. "In the Wainfleet and Burgh ward, I secured 1265 votes, with the Tories on 819 and Labour on 306, that is 52.9% of the vote for UKIP on a 35% turn out and this was classed as a safe Tory seat, but it has proved that there are no such things in the future. "I have got a long list of issues that want my attention in the council, but please contact me on chris.ukip@btinternet.com if you have any queries relating to my ward or the Lincolnshire County council." All very well saying "vote UKIP and you'll get a UKIP representative", but Pain makes the point himself that UKIP representatives don't represent anyone but themselves since there is supposedly no whip or policy direction. He seems a sensible chap, but on his own website says that UKIP has to be a broad church appealing to more than disaffected Tories - in which case the laissez-faire approach to policymaking is going to leave UKIP facing in lots of different directions at once. I thought this would be that Hunter-Clarke chump. Oh well. 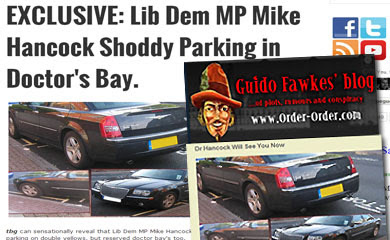 Renewed Calls for Hancock Suspension by Lib Dem. Hancock in the Dog House as Clegg Plays Catch-Up. Mike Hancock MP on Brink. Bow Group War Vs Iain Dale. Help For Heroes Snub EDL Donations. Farage on Brink of Deal With 20 Tory MP's. Farage Accepts Dorries' Tory/UKIP Joint Ticket. 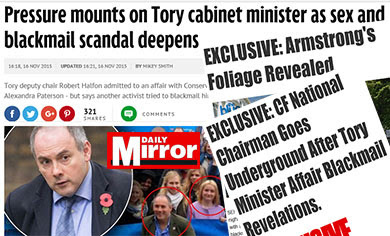 'David Cameron can no Longer be Trusted'. Labour Lead Tumbles to Just Three Points. 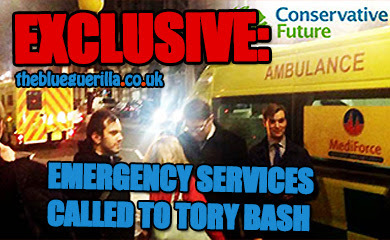 EXCLUSIVE: DASHTory Hyatt Defects to Lib Dems. Cameron Bows to EU Referendum Pressure. 70 MPs Signed up to Queen's Speech EU Amendment. Tracker: UKIP Support Doubles in New Poll. DASHTory Hyatt Quits 'Evil' Conservatives. Cameron Orders Cabinet not to Rebel on EU. Gove: I'd Vote to Leave E.U. UKIP in Defection Talks with 'Ten' Tory MPs. Nadine Dorries Reinstated as Panic sets in. Robinson Announces Tory Youth Eastern Election. Tory Rebels Threaten to Force Cameron's Hand. UKIP in Election Poll Surge.